It’s one year since our last Web Trend Map. A lot has happened, but there are not enough changes in the landscape of domains in the last 12 months to create another domain-based Web Trend Map. The big changes happened one level higher, on the social layer, that is: On Twitter and Facebook. I sat down with the video team of GaijinPot for a short interview about the Web Trend Map. It hangs in the headquarters of Google, Microsoft, Facebook, WordPress, and Yahoo! Japan. Even the CERN in Geneva has its own copy. The WTM4 poster has caused quite a stir. While the first map was hacked together in an afternoon, the second took a week, and the third devoured a month of concentrated work, the fourth Web Trend Map (due in February) has already taken more time in preparation than all previous versions combined. We are happy to announce that the coolest gift for geeks, the A0 poster of the 2008 Web Trend Map, as featured by The Guardian, WIRED, Le Monde, Corriere, kottke, Boingboing, Techcrunch, Mashable, Valleywag and literally thousands of blogs. We present you with the 2008 Web Trend Map, in all its beautiful beta glory. 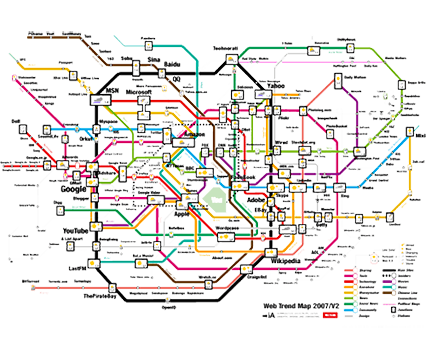 This time we’ve taken almost 300 of the most influential and successful websites and pinned them down to the greater Tokyo-area train map. 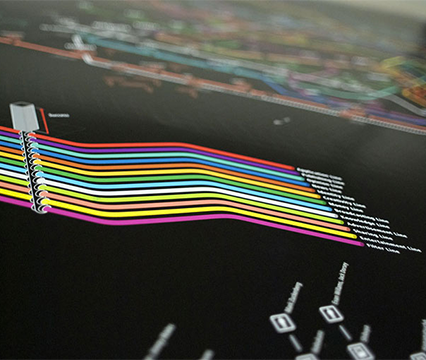 Those familiar with the new Swiss train station maps may recognize one source of inspiration. We’ve adopted some concepts from our good friend Adrian Schaffner’s work on mapping Swiss train stations. Trend Map 2008: What’s New? We’ve redesigned the Web Trend Map from scratch. It’s now presented as an isometric landscape. 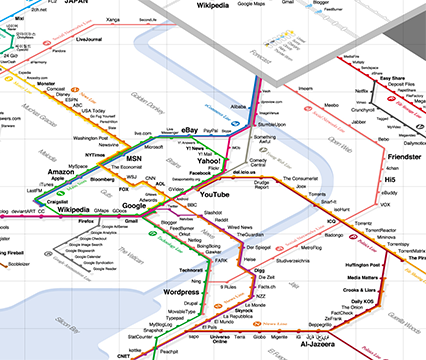 We have done it before, and now we’ve done it again—the poster of most successful websites, mapped to the Tokyo Subway, is back! The last couple of days we have received some excellent feedback on our article “Washington Post Redesign as a Wiki”. First of all, thank you to everyone who took the time to study our problem and form an opinion. To be able to receive input from the best people in the field is rare and rewarding. We got lots of applause, together with some questions and reservations. When I read this morning that USA Today "refashions itself as a social network", I got a little shock as I was worried that they are going to eat our client's lunch. Fear nothing, client. Among information designers the USA Today redesign is a laughing stock. As a Christmas and New Year’s present to our clients and readers we have created three fun Internet overviews. Your website is more important for your company and its brand portfolio than your business card, your brochures, the products you sell, your packaging, the address and the building your company resides in. As an information designer the interfaces we currently work on—no matter whether Apple or Windows—bother me. Yes, OS X looks a lot better than its predecessors, and Windows’ upcoming rip off of OS X looks better than the previous rip off.